The state broadcaster has been cleaning up on all fronts over the last three months. IT SEEMS THAT at present RTÉ radio can do no wrong – the state broadcaster has been having a field day on all fronts over the last three months according to the latest radio listenership figures. The latest JNLR figures have just been released and they make for very happy reading indeed for RTÉ executives. The ratings for every significant RTÉ Radio One, daytime radio, and all weekend slots have improved in the last three months. On top of that, the fortunes of 2FM, which had struggled badly in recent times, have undergone something of a renaissance it seems. RTÉ’s heads of respectively Radio One and 2FM, Tom Maguire and Dan Healy, spoke to TheJournal.ie this afternoon in the aftermath of the broadcaster’s positive results. “This improvement, it’s been patient and slow and deliberate. It’s great but we’re not finished yet,” said Maguire. The age profile for Radio One listenership in particular is really coming down. It’s because we’ve been able to invest in people, something we weren’t able to do in recent times. “There are 44,000 more daily listeners to 2FM today than there was this time last year,” Healy said meanwhile. The station has changed around completely from what it was two years ago. It goes to show the station has had its struggles but we’ve definitely turned things around. We’re really giving it a go now. Breakfast Republic on 2FM is one of the major success stories of this period, with 196,000 listeners bringing it into the top 20 of most listened shows for the first time (although this is based on a new timeslot, having absorbed listeners who would have previously been tuned in to Ryan Tubridy) with Today FM’s Ian Dempsey making way. Anton Savage and Matt Cooper on Today FM are among the big losers this time round. Ray D’Arcy’s new afternoon show on Radio One is doing well with figures up by 9,000 to 199,000 since July, while Ryan Tubridy is a big winner – his new show in the slot formerly occupied by John Murray on Radio One now has 9,000 more listeners than in July with 307,000. I love #JNLR day. Pretty much every radio show on the go is up up up. Always up. People just switch on more and more radios. Marian Finucane is the big winner as regards weekend schedules, with 396,000 listeners for her Saturday morning show seeing an increase of 23,000 over the last year. This RTÉ dominance is not a new story – when the last group of figures were published in July the state broadcaster occupied 18 of the top 20 weekly listenership slots – and 17 of those belonged to Radio One. 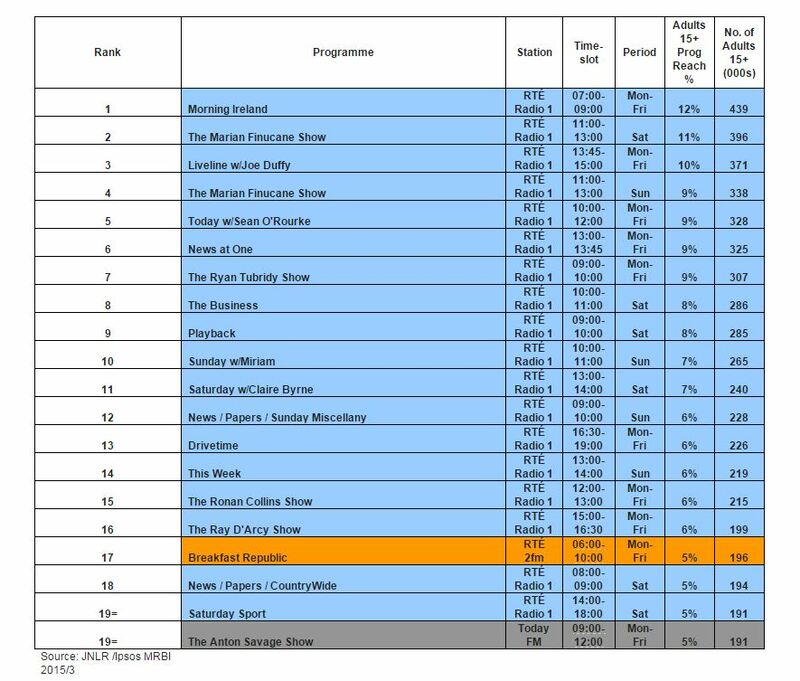 That figure is now 19 of the top 20 with Anton Savage now the sole occupier of a top 20 slot from outside RTÉ. Currently 83% of the adult Irish population listen to the radio each day. We are truly a nation in love with the radio. RTÉ Radio One remains very much the big boy on the court – with 22.3% of listenership nationally it can boast almost three times the listeners compared to its nearest non-RTÉ rival Today FM (7.9%). Email “RTÉ Radio One and 2FM have had a STELLAR three months - here are the latest radio figures”. Feedback on “RTÉ Radio One and 2FM have had a STELLAR three months - here are the latest radio figures”.